Wayne moved us in March 2011, he was punctual and gave us clear direction on how the day would progress. Prior to the move he delivered all we needed to pack up our items as this was how we chose to do it. Wayne had us in the new house well before expected completion time. 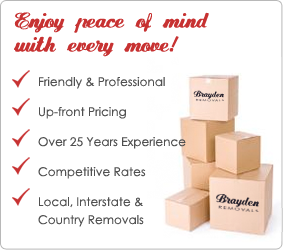 If we needed to move again we would certainly contact Wayne at Brayden Removals for the job.